Mesic, partial shade, temperate, moist. Stemless, dense rosette, fine leaves spreading in all directions. 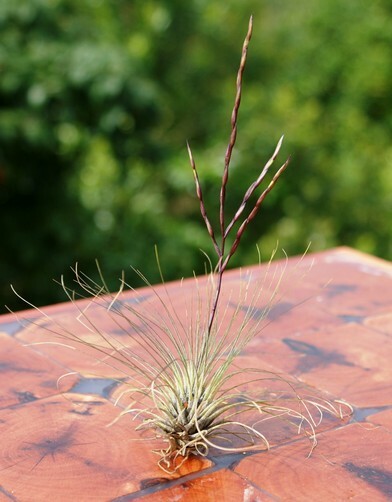 This air plant has a dense rosette withdelicate thread like leaves. The inflorescence is laxly bipinnate with white to lilac petals. Tips of petals are strongly recurved. The green leaves can tolerate slightly lower light conditions but it does need some bright light for part of the day. Fine leaves means can’t store water so frequent watering. Some shade to protect from drying out.